Publicis Groupe has released its eighth latest holiday message to employees and viewers, giving well wishes for the upcoming holidays and New Year. The spot is Levy’s final video to the company, and nods to his impending retirement which is set to take place in May 2017. It showcases Levy being undisturbed by movers as he delivers his annual speech which discusses the group’s 2016 performance, account losses and hopes for the coming year. In the #WhatsNext video, the global CEO talks about the group’s “Power of One” outlining the challenges for those who have undertaken new roles in the organisation. “No silo, no solo, no bozo,” Levy added. The video sees a group of movers packing and removing belongings from Maurice Levy’s office, including a Thor hammer-esque “I’m the boss mug” which could only be lifted by the renowned adman himself. One mover discovers a safe full of his beloved colourful candy jars which are so numerous to a point a fork lift is required to carry all of them out of the office. Meanwhile, another gets trapped by a hidden door in his office. 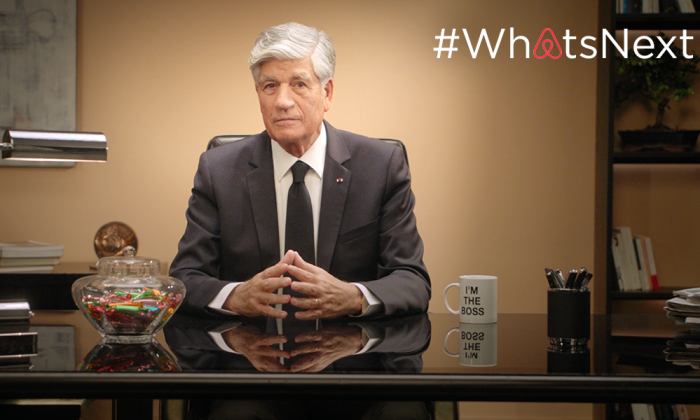 The video concludes with an Airbnb link for viewers to rent the space it dubbed as “The top of the ad world”, in order to give users a chance to experience 24 hours in the busy life of a global CEO. “Well, almost. Unlike most busy CEO’s you won’t spend the night at the office, but in a beautiful apartment nearby instead,” the ad read. Last year, the group released the cheeky #TheSkippableWishes, which saw Levy starring in a series of spoof ads. He relays his end-of-the year message in a wig, in a bathrobe, and in one scene, stuck in a sink. The video was created by Marcel and Prodigious.